Learn how to sew the different parts of your clothes and the whole thing will come together without you pulling your hair out or becoming discouraged. Take the time to practice and make samples so the real thing will be easy. Consider creating a folder in your bookmarks as a reference tool or create samples and printouts to create a hard copy reference tool. Darts are one of the first part of a garment that you sew. Find basic beginner information here so there will not be a scary chill down your spine when you start to construct a garment. Darts, when made properly, blend into a garment. Learn tips and tricks to sewing darts that shape a garment without standing out on their own. In order to obtain accurate results when you are sewing, you need to transfer the pattern markings on to the fabric. Learn how to transfer the pattern markings and you will end up with a garment that is made the way the pattern intends. Not all fabric can be pinned in place while you are sewing. Unsightly pin holes can be avoided while managing un-pin-able fabric. Learn solutions here. Knowing how to sew a set in sleeve isn't magic. Learn tips and tricks to have professional results when sewing a set in sleeve. If we were all the same height and build all clothes off the rack would fit properly.Since we are all different, we usually need to hem clothes. Learn how and find all the information you need here. Many sewing machines have a built-in blind hem stitch capability. Learn tricks to using a sewing machine blind stitch to sew hems and you may find yourself using the machine blind stitch on more than just hems. If your asking where to start or what direction to sew a seam or stay stitching this page has your answers. 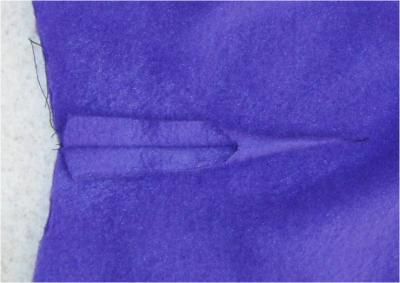 Full directions that show how to sew a bound buttonhole in a step by step format. Here's a quick tip to mark or transfer dots found on sewing patterns to your fabric. Almost ever homemade garment requires you to rip out stitches somewhere in the construction, even if it's just to remove basting stitches. Learn how to properly rip out or remove sewing stitches and then resew or repair a seam here. Learn how to preserve your favorite sewing pattern so you can use it over and over again for years to come. Have you had a garment turn out completely different from the pattern envelope measurements? Learn some of the ways these problems can happen. If you've ever had to buy the second pattern because of missing pieces you know the problem, now read this for a simple solution. Simple to follow text directions to learn how to sew on a flat button. Simple to follow text directions to learn how to sew on a shank button. What kind of interfacing to use on see-through and lightweight fabrics is a common question. Learn tips and tricks so that your pockets are as perfect as the rest of your garment. No need to detest sewing pockets if you know what you are doing. Interfacing: Sew in or Fusible? Pointers on choosing what type and weight of interfacing to use when you are sewing a garment. Learn your choices here. Joann Fabric and Crafts offers these free directions for many projects. Browse the selection and the instructions for those that appeal to you. Many of these require a purchased pattern but many are totally free patterns.